I wrote yesterday that I didn't have much to say about the Flint water crisis until it got national attention. Has it ever! Wednesday, President Obama spoke on the issue while visiting the North American International Auto Show. Yesterday, WXYZ reported on two more responses by the federal government. First, Congressional hearings to be held in Flint water crisis. Speaking of throwing people under the bus, the report above mentioned an EPA regional adminstrator resigning. Here's the clip from WXYZ on that part of the story: EPA administrator resigns amid Flint water crisis. An EPA administrator is out of a job, and her agency is cracking down on the response to the Flint water crisis. She's the second official to resign over the scandal, joining Michigan Department of Environmental Quality Director Dan Wyant. I expect more resignations and firings to come. *But probably not. Instead, this quote from Representative Jason Chaffetz, chairman of the House Oversight and Government Reform Committee, indicates they have one of the GOP's favorite targets in their sights instead, "The EPA is rife with incompetence and Region 5 is no exception. Mismanagement has plagued the region for far too long and Ms. Hedman’s resignation is way overdue." The same article reports that the U.S. Department of Justice is investigating the EPA as well, so the concern is bipartisan. 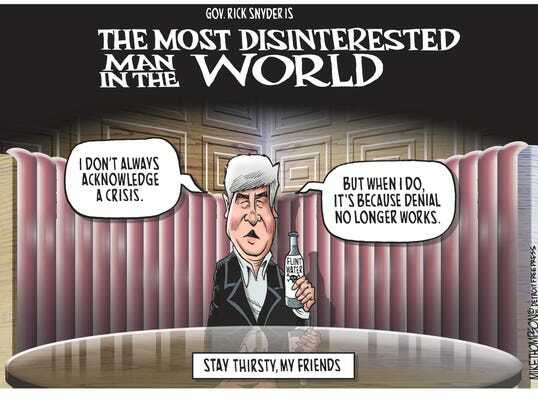 As for Snyder, the just thing may be that he should resign, but I don't expect the just thing to happen any time soon. That would give Michigan Governor Brian Calley as an incumbent in 2018. Neither Attorney General Bill Schuette nor the more pragmatic Democrats who would run for the office would want that. Better to campaign against lame duck Snyder for an open seat. I wouldn't be surprised that a Republican Congress will go after the EPA when the real problem was state-level Governor-appointed Emergency Managers and state health department officials who stonewalled and delayed. Nope, neither was I. I suspect Representative Lawrence, whose district is right across the street from me, might be. She called for this investigation and asked for Snyder to testify. She might not have expected the Republicans to turn it into one of the EPA. Here's hoping I'm wrong and she's prepared for it.